Smartlox installs intercom systems in homes, businesses, schools and anywhere restricted access is required throughout Edinburgh. We install security systems that help keep your family or staff safe by restricting access to your property through security tags, key fobs and entry keypads that use numeric codes. You eliminate the need to replace door locks or have additional keys cuts when the existing keys are lost. Card operated key fobs or security cards are issued to only those requiring access. If these fobs or cards are lost then, they can be immediately deactivated thus making it impossible to enter with these cards. All doors and entry points are protected from being left unlocked once your access control security is connected. All doors within the system are locked automatically as they’re closed. 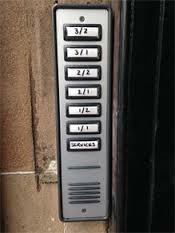 These entry systems can also be customised to stay open at certain times throughout the day when programmed. Entry may be permitted for front door use, but you can program the system to prohibit internal door access. Again this can be fully customised to suit varying levels of security. Zone control is a popular choice with door entry systems. Another benefit is that access can be given to individuals who need to gain entry at various times of the day. 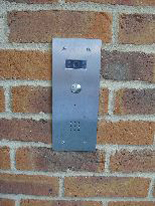 Smartlox has over 25 years experience in building and installing intercom entry systems. We work with some of most reliable and easy to use systems on the market. Full training and maintenance are also provided with all our systems.